The Third Pillar of Scaling - Infrastructure. Two weeks ago, I introduced the topic of creating execution capability for businesses what want to scale. I talked about how people are one of the 3 critical ingredients needed to scale a business and I introduced some ideas about developing roles and responsibilities, effective recruiting of employees, and leadership and management styles that work. Last week, I talked about the importance of building effective processes in your business. 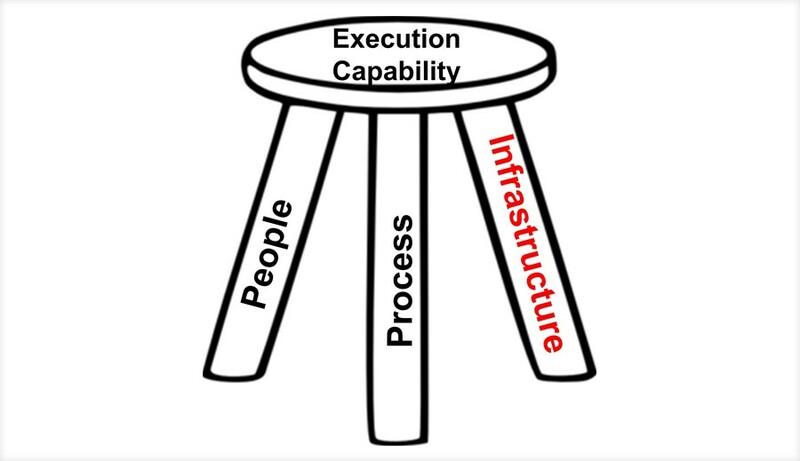 This week, in the final installment, I discuss the role of infrastructure and the part it plays in Execution Capability, and how the 3 pillars collectively can create the proper circumstances to allow you to scale your business. Even Steve Jobs and Michael Dell knew when it was time to move out of their homes and garages and into buildings that would support the scaling of good entrepreneurial businesses into great global businesses. Instinctively, you will know when it is time to leave your roots and move to suitable premises for your growing business as well. Growing businesses need to locate in areas that are close to transport links, close to where skilled labor is available, close to power, water and good telecommunications infrastructure, including broadband Internet services. Also, it is important to provide a comfortable environment for employees if you want to be able to hold on to them, so an attitude of “it will do for me” may not work. Depending on the business type, it may also be important to be located close to customers. This all comes at a cost. You will need to have access to capital to make the leap from entrepreneurial start-up to successful mainstream business. Some of us use our personal savings or soft loans from family members to enable us take the first big step. Others find Angel or seed capital investors to bridge the gap between the cash they have and the cash they need, in exchange for partial ownership of their business. In recent times, crowd funding has also become popular wherein micro amounts of financing is raised from a large number of people in the general public in the online environment. No matter how you raise the finance, it is a crucial part of gearing up your business for growth. But it does not stop there. If you manage to buy or lease a building, you are still faced with the need to kit it out. Many premises come as a shell and require significant investment before you can consider moving in. Not only will you need to provide floor coverings and desks and chairs, but you will also require proper lighting and perhaps climate control equipment. The right IT infrastructure to support your business is also an absolute requirement. If you are involved in manufacturing, you will also need to invest in plant and machinery. As you can see from the foregoing, it is not a trivial exercise to put the right infrastructure in place and a great deal of forward planning is required. Click here to read the full article and discover the important jigsaw pieces you must have in place before leaping forward…..